Omotesenke Domonkai advisor awarded for promoting U.S.-Japan friendship. Soyu Yuriko Tanaka receives the Foreign Minister’s Commendation in Honor of the 70th Anniversary of the End of the War from Consul General Harry Horinouchi on Dec. 9. Soyu Yuriko Tanaka, advisor for the Omotesenke Domonkai Southern California Region, was presented the Foreign Minister’s Commendation in Honor of the 70th Anniversary of the End of the War on Dec. 9 at a conferment ceremony held by the Consulate General of Japan in Los Angeles. Consul General Harry H. Horinouchi praised Tanaka’s accomplishments and presented her with a certificate from the foreign minister of Japan. The Foreign Minister’s Commendation in Honor of the 70th Anniversary of the End of the War is awarded to individuals and groups for outstanding achievements in the promotion of friendship between Japan and the United States. Tanaka was born in 1933 and graduated from Meiwa Woman’s Jr. College in Sendai City. In 1957, she married and came to the United States. She received her Omotesenke teaching credential in 1973, before receiving the highest professional rank from the Omotesenke Headquarters in Japan in 1988. Through her own tea group with students, known as Yuwakai, and tea ceremony classes, Tanaka has actively promoted the study and appreciation of tea ceremony in Southern California. An active member of Omotesenke Domonkai Southern California Region since its establishment in 1970, Tanaka has served in important positions, including executive director, vice president and advisor, contributing to the organization’s growth. She has also taken on such responsibilities as chairperson of Omotesenke Domonkai’s anniversary events and other high-profile gatherings, guiding them to success. Tanaka received from the Omotesenke Headquarters the Shibu Koro-sho (Special Award) in 1999 and the Shibu Tokubetsu Koro-sho (Distinguished Award) in 2001 and 2010 for her many years of devoted and outstanding service. 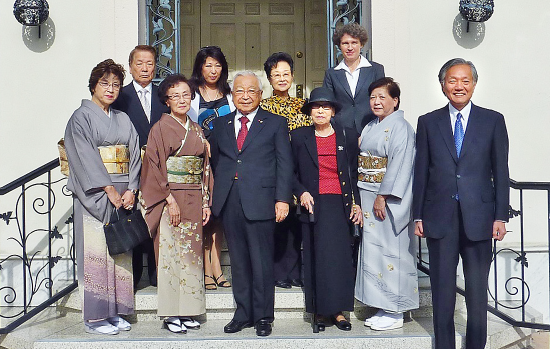 Tanaka is joined by friends and family at the luncheon held at the consul general’s residence. In addition, Tanaka has served as a vice president and advisor to the Japanese Women’s Society of Southern California, and she received their Tokubetsu Koro-sho (Special Award). She also volunteers for Keiro Nursing Home visits, Nisei Week events, the year-end welfare collection (saimatsu tasukeai bokin), and other philanthropic causes. She received the 2009 Community Service Award from the Orange County Japanese American Association. In 2011, she was selected Woman of the Year by the Japanese American Citizens League, Downtown Los Angeles Chapter and the Japanese Women’s Society of Southern California. Her accomplishments have been recognized with certificates from the mayor of Los Angeles and the Los Angeles County Board of Supervisors. 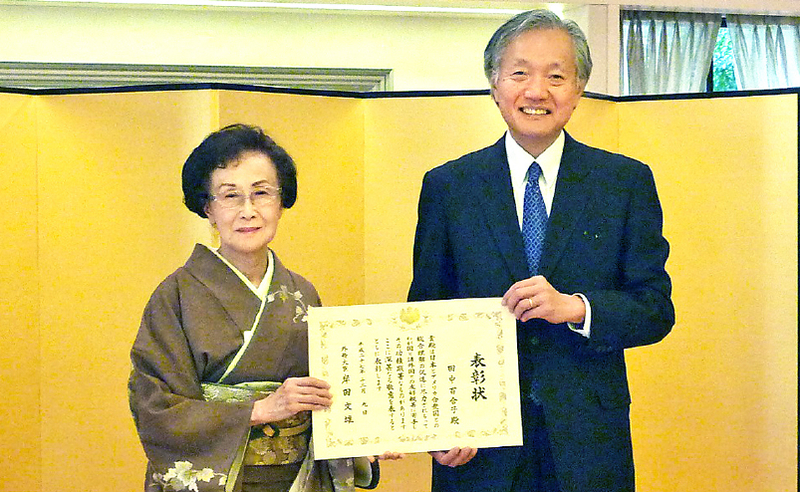 At the conferment ceremony, Tanaka spoke about her happiness in receiving the award and shared her appreciation for her husband Fred and daughter Risa Uyematsu; then, in thanking the members of the Domonkai Southern California Region, she related some heartwarming episodes about their journey together contributing to the spread of tea practice. After the award ceremony ended with words of congratulations and a toast from Domonkai Southern California Region President Mack Miyazaki, the attendees enjoyed lunch with the consul general and his wife, Sabine.